A south paw in cricket by and large is a treat to watch on the field, be it any facet of the game. His casual laid back attitude makes it even more elegant. English cricketer David Gower is an example. In music too, there have been many such left handed stalwarts in the laya field. Among the contemporary musicians, we have a young vidwan who plays mridangam left handed in a relaxedtypically laid back causal manner, both on and off stage. The way his neck pans the entire auditorium in a gyratory motion while his hands are busy playing the instrument, is a treat to watch. K. Arun Prakash shares his ideas on music and related topics. In the initial stages, I was groomed to become a singer. My father L. Krishnan was with the AIR and I frequented the station with him during my holidays. During one such visit in 1977, I happened to be in the room where mridangams of various srutis were stored. I picked up the one that was lying on the floor and started playing it. That I played it with my left hand was considered unusual by onlookers in that room. AIR staff artist vidwan M. N. Kandaswamy Pillai was also there to select a mridangam for his programme. Impressed, he asked my father who my guru was. My father grabbed the opportunity to request him to teach me the instrument. I came under his direct care, from then on. Probably the fact that I played the mridangam with my left hand must have reminded him of his guru Palani Subramania Pillai and that might have inspired him to take me in his coterie. Classes went on for several years. After school (Sri Ramakrishna Mission T.Nagar), I would head for his house and training went on till 8 p.m. I can take pride in saying that I trained under one guru, from the basic to the advanced stage. Although I imbibed his bani, his advice was to follow the bani of the main performer. He treated me like his son, during classes, but was a real task master. Never has he complimented me or commented about my playing, after a concert. I strictly adhere to his advice in my approach to concerts. Until 1985, I performed regularly but never cared to attend concerts by others. I preferred listening to film music. Thanks to Sanjay Subramanian and Sriramkumar, I started evincing interest in attending others' concerts. It became an obsession and soon, Sastri Hall became a favourite haunt where we would hang out and analyse the evening's kutcheri. YACM has also been a big turning point in my life and this must be true of all young artists of today. 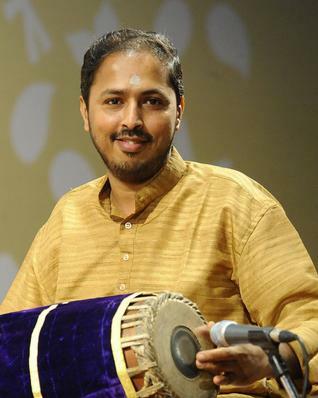 Aspiring to become a professional singer in the Carnatic music circuit, he studied at the Music College under several stalwarts including Musiri and Brinda amma. He was with GNB for about six years and trained alongside Thanjavur S. Kalyanaraman. Simultaneously he acquired knowledge of other genres of music such as Hindustani, ghazal and folk. He then worked with film music director S. Rajeswara Rao as his assistant, before finally joining AIR. A silent person, he never showed off his knowledge. Even during composing sessions, never would he give his opinion unless asked. He was a monarch of the cassette industry, composing for several light classical and devotionals. The spectrum of singers he has worked with ranges from Dr.M. Balamuralikrishna to ‘Mahanadhi' Shobhana. He also brought out several Christian and Muslim devotional albums, with their flavour nativity intact. He had the rare capacity of tuning lyrics as and when he read them and many stalwarts mentioned this when they came home to condole his death. Neither my guru nor my father was after money, name and fame. Incidentally my father's first death anniversary falls on August 15. Yes. I am a diehard fan of Ilaiyaraaja. Film music stops with him, as far as I am concerned. I can speak volumes about his compositional and orchestral values to justify my stand. (He sings an old hit of Ilaiyaraaja with the BGM and explains the intricacies). Similarly his re-recordings are out of the world. Having heard me sing, he also offered me a song. That it did not fructify is my bad luck. I admire MSV equally who has gifted us with immortal melodies. I have been composing tunes and am already working on a few projects. My mother was a composer and singer but never ventured into the commercial field. She has many short stories to her credit. My parents' influence has kindled and encouraged the composer in me. My wife and children have been very understanding, without which I could not have continued my musical sojourn. I have to thank my employers, Southern Railway, for being considerate and helping me in my development as a musician. Colleagues have been a great source of support. When one is mentally at peace, challenges become a cake walk. During a concert abroad, Sanjay sang a 21 akshara Tiruppugazh and gave me the tani. I came out unscathed and he was generous enough to announce that I was not informed of the item before and that what I had played was impromptu. We have to uphold the tradition handed over to us by seniors. I have started Nadamrta where concerts will be featured with that in mind. Carnatic music has to be carried forward and the responsibility lies on musicians like us.